You can change your targets by clicking on the ‘Adjust targets’ option in the side menu of the main diary window or by selecting ‘Options’ from the top menu bar. To change your target weight simply use the arrows to change the value shown in the target weight box (1). The weight will be shown in the units currently selected in your user profile. The activity level slider (2) lets you set your activity level. You should set a realistic level, setting the bar too high will increase your daily calorie allowance, but if you do not maintain the activity level you have selected you will fail to meet your targets. If you find you are losing more or less than your weekly target you should adjust your activity level to compensate. If you are losing more than intended you may be more active, however if you are not meeting your targets you may need to adjust the slider to a more sedentary setting. 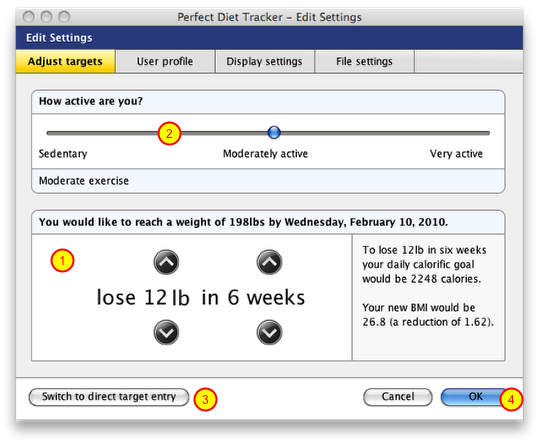 If you would prefer to set your own calorific targets you can switch to the direct entry method (3) by clicking the ‘Switch to direct entry’ button. When you are happy with your target weight loss and activity targets click the ‘OK’ button (4) to save the settings. If you would like to set your own calorific target select the ‘Switch to direct entry’ button. You can then enter your own calorific target and target weight (1). You should only do this after consulting your doctor or nutritional advisor to obtain a suitable value for your height, weight and nutritional requirements. 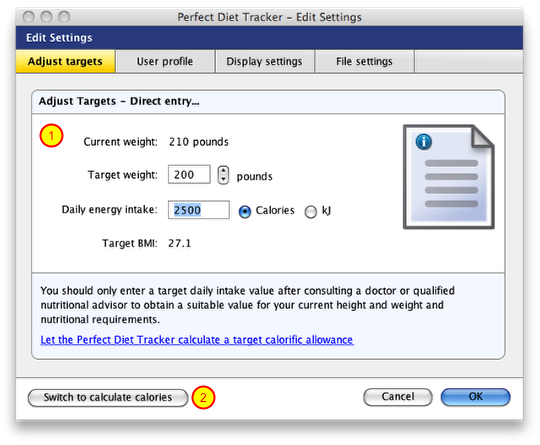 If you would like the Perfect Diet Tracker to calculate your target calories click the ‘Switch to calculate calories’ button (2).